Lattice Semiconductor has released industry’s first pre-certified, production-ready modular solution for high speed wireless infrastructure applications. 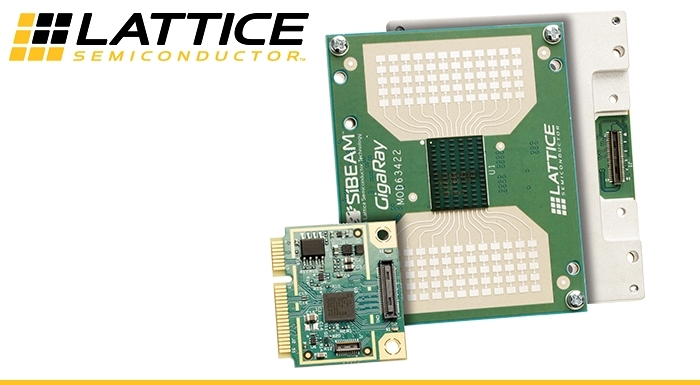 The new GigaRay MOD65412 60 GHz module set is based on Lattice’s SiBEAM phased array antenna and electronic beam-steering technology that minimizes installation time and substantially reduces maintenance costs for operators of fixed and mobile broadband networks. The module set offers a complete solution that accelerates the development and lowers the design risk and implementation cost of communications equipment. Increasing production and consumption of data, particularly in urban environments, is driving operators of commercial and public broadband networks to add capacity at the edge of the network. The license-free 60 GHz band offers operators the unique combination of high data capacity, high spectrum reuse and low administrative costs, which collectively enable an effective alternative to expensive and time-consuming fiber deployment. Conventional 60 GHz products have been cumbersome and expensive to install and maintain. Lattice’s GigaRay modules give operators the opportunity to fully exploit the potential of the 60 GHz band. According to Lattice, urban consumers, enterprises and smart city initiatives are driving the demand for ubiquitous high-speed data in all regions, but at a price point that fiber cannot match. Lattice’s GigaRay modules using SiBEAM phased array antenna and beam-steering technologies are the perfect combination to enable network operators of all types to deliver gigabit-class edge connectivity efficiently using the 60 GHz band. The MOD65412 module set supports distances of up to 200 meters at 1 Gbps TCP/IP and up to 300 meters at 300 Mbps TCP/IP data bandwidth, with a 45 degree steering range. To support evaluation of the technology and prototype development, Lattice is offering a mini-PC based SK65415 evaluation kit and the SK65412 development kit.